An important change related to the single fuel tank, which was now replaced by two interconnected 6.75 gallon tanks, that increased overall fuel capacity, and were positioned inside each rear wing. In this way, the spare tyre could be fitted vertically behind the rear compartment, so providing increased luggage space. The two Stromberg carburettors, from the Series 2, were replaced by a Solex twin choke unit with a large, single, air cleaner. This arrangement, together with a cast iron exhaust manifold, resulted in a reduction in the power output and torque generated, from 80 bhp and 94 ft/lbs respectively to 77 bhp and 92 ft/lbs. 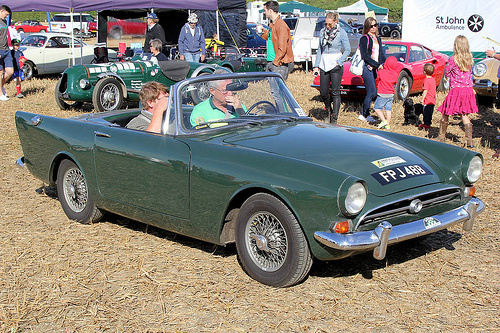 The single model from the Series 2 sports car was now replaced by two models in the Series 3 - a convertible, now called a "Sports Tourer", and a new "Grand Tourer" which sported a removable hardtop containing a large backlight. Although a soft top was not included with the GT, a tonneau cover was available. The principal benefit of the GT version was that an upholstered occasional rear seat took the place of the space taken up by the folded soft top. The GT's hardtop was more angular than that previously available, and the doors now had leading edges with square rather than previously rounded edges. The resulting benefit was that complaints relating to draughts, created by the previous hardtops, could be eliminated. Comparing the two Series 3 models, the cheaper convertible could always have an additional hardtop added, whilst the GT had the benefit of the extra space behind the two seats. By now, the Alpine was developing a favourable reputation in respect of its ride qualities, finish, and delux interior. However, its principal detraction was its increasing lack of performance. Further, in terms of competition, by 1963, its main competitor, the MGA, had been superseded by the MGB, with its 1.8 litre engine developing 95 bhp and 100 ft/lbs of torque. This was something that needed to be addressed. Rootes Group was aware of developing changes in the sports car market brought about by more crowded roads and a greater emphasis on creature comforts. This was manifesting itself in the growing transition towards sporty saloons, such as the Mini Cooper S, which offered comparable performance together with increased seating/luggage capacity. The original wedge shaped design of 1959, with its pronounced fins was, by now, becoming dated. Accordingly, the rear wing design was set to follow the new styling characterised by the Hillman Minx saloon. Production of the Sunbeam Alpine Series 3 sports car was finally ended in January 1964, when 5,863 units had been built. However, it was immediately replaced by the series 4, whereby some of the shortcomings of the Series 3 would be rectified. A 1963-64 Sunbeam Alpine Series 3 in really good condition would fetch in the region of £8,000/$13,000. However, an example of this slightly rare variant in superb condition would command around £23,000/$36,000.